Dickinson to Durban » Climate Change, Environmental Justice, Mosaic Action » What’s your Issue? These children showed their gratitude for the food that we brought through song. 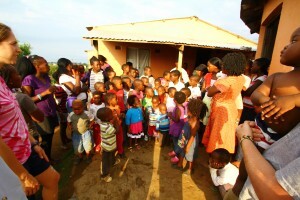 The last week of our three week adventure in South Africa was spent in the Valley of 1000 Hills. We spent the first few days working at orphanages and then two days exploring the Valley. For me, spending that last week in the Valley of 1000 Hills was the most appropriate way to end our climate change trip. It was a week for the group to do some reflection, individually and communally. We reflected on many things, but the link between climate change and poverty stuck with me. How is it fair that we were born to the comfortable lifestyle that we live. While we are purchasing iPhones and fancy laptops, these people cannot put food on the table. The percentage of the South African population living below the poverty line is 50%. That does not make any sense. One in every two people living in South Africa is living below the estimated minimum level of income needed to secure the necessities of life! South Africa is considered one of the “better off” African countries. The images in our minds of the distribution lines, the grateful people, and the pride in what they did have, stayed with us all. We all wanted to change their situations for the better. Then Neil asked us the dynamite question: considering all that we have learned this semester and saw from the children of Makaphutu and Lily of the Valley to the women of the distribution line; is climate change the most important issue to each of us? Climate change will make this problem even harder to fix. So I guess what I am saying is that I do think these people are extremely important, and one of the ways that we can indirectly help them is by dealing with climate change. Donations to organizations like Makaphutu and Lily of the Valley are great, and getting out there in person is even better. We also need legislation that will protect them and their families in the future. We need mitigation legislation in countries like the US, and adaptation legislation in areas like the Valley. I know that the COP is trying to do this, but it is not working fast enough, so we (the Mosaic) have an obligation to share what we have learned about climate change, about the people, about the link between climate change and poverty; and take up their cause. Human rights and climate change are linked, and we can take up two huge issues at once. It won’t be easy, but I’m going to give it my best. 17 Responses to "What’s your Issue?" This reflection really shows the interconnectedness of society and nature. While climate change is often viewed as an environmental issue, its impacts involve so many other aspects of life and society in general. It is necessary for people to notice this relationship and in changing their behaviors we can improve both the natural world and the lives of people. Many of us may not be directly reminded of the effects of climate change on a day to day basis so it is important for us to think about those who are faced with poverty and are losing their homes because of our actions. Growing up and living in a privileged country presents the idea of choice. We are given a choice whether we will conserve energy, purchase “green” products, limit our overall consumption, etc. Every morning we turn on the faucet, the shower, flush the toilet, wash the dishes- and with each action we know that there will be enough water for each activity. If our watersheds suddenly ran out of water or the access to the excessive amounts of food we consume per day were to run out, our lives would be dramatically different. Without the privilege we assumed from birth our choices would very quickly turn into trade-offs. We would be forced to treat each resource more sparingly and there would be hardly any consideration as to what we would do about climate change because that is not going to effect us very directly tomorrow. Climate change is a future-minded concept and it’s difficult to think of the future when you are concerned about how you will survive tomorrow. As privileged people we must take on the responsibility of making ethical choices because much of the world does not have the plethora of options like we do. So, is climate change still the most important issue? Even if it’s not top on one’s list of priorities, we can at least find a way to weave environmentally friendly choices into our daily schedules in respect for those who don’t have the option to choose to do otherwise. Like Christine said, this is bigger than an environmental issue this is a human rights issue. Christine, I think this post perfectly encapsulates the events and emotions of the last week and the trip overall. The most vulnerable countries in the world (those in geographically vulnerable locations with the least capacity to adapt to climate change) are disproportionately the poorest people in the world who have contributed the least to causing the global issue of climate change. Developed nations (namely the United States) should have taken action years ago to mitigate emissions, but there is absolutely no excuse now for our inaction as a country. Climate change is not only an environmental issue; it touches on every facet of life from human rights, to the economy, to development, and poverty. It infuriates me that the United States will not commit to anything and it is even scarier to me to hear what some of the presidential candidates have to say about climate change (that theoretically our future president might not believe that human caused climate change is happening at all). The United States government has made it clear to the world that they are not going to commit to anything for as long as possible, but that does not mean that we, as citizens, cannot do anything. Actually it means quite the contrary- we need to work even harder- AND NOW. I completely agree with you about how difficult it is to prioritize time, energy and money when dealing with climate change and also observing extreme poverty. I think the two issues are interrelated, however. In another one of my environmental studies classes, we have discussed the relationship between climate change and poverty. We talked about how poorer nations are less able to think about long term effects of their waste and emissions because they need to spend more energy focusing on acquiring water and food. One of the issues that we studies that has really stuck with me concerns women and family planning because places with severe poverty tend to be areas with large population growth. I think this issue presents a really great opportunity to connect many issues together; women’s rights and access to family planning education, reduction in populations of poor nations, and therefore reducing these countries contributions to global warming. Climate change has numerous causes and definitely requires a multifaceted solution that takes into account assisting poorer developing nations to improve industry and standards of living. I also agree that it is difficult to figure out how to integrate the issue of poverty into the overarching problem of climate change. In my ecological anthropology class we talk a great deal about how vulnerable indigenous communities are to climate change, especially since they rely so heavily on the raw resources and weather patterns of a landscape. Learning about different communities has made me realize more how important it is to include their perspectives when assessing the specific environmental issues resulting from climate change. Local communities can be a huge resource for gathering information on how climate change is affecting different landscapes on a more personal level. Maybe new policies that include this information can therefore be more productive and direct. I think that you brought up a very interesting point when it comes to what issue is worse, climate change or poverty. I asked myself the same question, “is climate change the most important issue to each of us?” Though I understand where you are coming from, that changing our ways in order to fix the climate change would have a ripple effect, that would eventually continue to help those at the poverty level. I would have to state that I believe that poverty would be the most important issue to me. What happens when/if the climate change issue is fixed? Unfortunately those people are not going to become better off solely because of natural resources. The world today is not that easy. I feel like those people need just as much help, maybe more so than the climate change issue. In my mind because they are people their issue is more direct making it more important to me personally, where as the climate change issue could be seen as more indirect issue. I think that the question about climate change and poverty is a very important one. 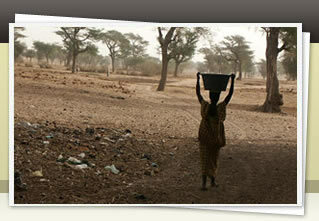 Climate change affects all people, and has a significant impact on people who live in poverty. It is important to want everyone to take actions to help decrease climate change by decreasing carbon emissions, as well as other behavioral changes. However, when a family is barely able to put food on the table, is it fair to ask them to try to reduce climate change? Is it fair to ask a family barely getting by to take on more responsibility? This raises the issue of whether sustainability is something that all people should be required to do, or is a luxury for the fortunate rich countries. I think your point that climate change is not just an environmental issue, it is a human rights issue, is extremely important. Unfortunately it is easy for many people to get lost in the trivial problems of our everyday, privileged lives, and forget about larger, global issues. Many of us have not witnessed firsthand communities suffering from poverty as extreme as this, and I think its important to educate people about what is going on in different parts of the world, and how climate change can really be devastating. Dealing with climate change is an ethical issue, because our actions are contributing to it and may affect other people far worse than ourselves. I think your discussion shows that climate change and its effects need to be mitigated with a multifaceted approach, at both international and local levels. From personal experience as well, I agree that it is challenging to see poverty-stricken communities without feeling guilty about our own lifestyles. Rightfully so, it forces us to contemplate our everyday decisions, as well as what we can do to help. Unfortunately, there is not just one thing we can do to help – there are MANY “things” that MANY people need to do. It is important to remind ourselves that we should not feel guilty for the way we were brought up – they are almost two separate worlds – instead, we should make the best of efforts to help those in need. While we find happiness amongst our everyday lives, so too do people in poorer communities, simply because they do not know any better. Perhaps, it takes more for us to be satisfied. The comparison of our lives to those less fortunate is difficult but necessary. As climates get hotter, the number of those affected by the rising temperatures only go up. Those who are already suffering from poverty are also the most susceptible. The gap between rich and poor in South Africa is horrendous. Therefore, bringing attention to this issue comes at a crucial conjecture. We have to reevaluate what we consider the necessities of life in this country and how much we are willing to sacrifice to help our fellow man. It is extremely important to note the fact of how influential climate change is to poverty, especially in regards to water. The United States has trouble emphasizing with a nation that is struggling to provide water, which is a basic human need, to every citizen. For most water flows freely from the tap and we can not fathom a day in which we may have to walk miles to have access to water that is not even properly treated. As climate change worsens scarcity is only going to become a bigger problem and force conflict. Unfortunately, because most people will never be able to experience how much climate change is effecting other regions there is a serious disconnect and lack of motivation to instill serious cultural change. It is important that blogs like these are shared and more light is shown on how our lifestyles are having adverse effects on people from completely different regions. Christine, my gut reaction to your question is a rather cynical one. How is it fair? How is anything in life fair? It isn’t quite simply. True, its not fair for other people to suffer disproportionately from climate change, but if we are going to feel sorry for people abroad, what about those being massacred under repressive regimes, or villages whose water is being sucked out, environment polluted, and workers killed by American corporations? What about immigrants in our own country who are worked to death in the worst of conditions and subjected to carcinogenic pesticides, whom we ignore at best, hate and deport at worst. What I’m trying to say is there is injustice all around us everywhere, everyday, throughout history, and yes sickeningly each and every one of us is implicated in it somehow, so I don’t see how saying climate change produces unjust conditions makes it any different from anything else, or how solving it would make a significant dent in the overall ethical issue of inequity in the world. Of course climate change is a pertinent issue and needs to be resolved if at all possible, but we can’t even get our “democratic” government to solve inequity problems in our own country. The very same government who has crushed democracy abroad and brought ruthless dictators into power for the sake of politics, power, and economic benefit. There are seven billion people in the world, but only a few hundred million live the way we do. You are correct to recognize that is wrong. You are right to be moved when you come face to face with the reality of suffering, and it is worthy that you want to make a difference. If this is the cause you choose to devote your time to then that is a laudable effort- but don’t let yourself forget that climate change is only exacerbating the larger fabric of an unjust world, full of corruption and ignorance. If we solved this issue tomorrow, it would be a good thing and some people would be better off for it, but I would hesitate to pat ourselves on the back. If we truly care about the issue of inequity, we must be willing to face the ugly truth in all contexts and not confuse the symptoms with the heart of the problem; we must understand that it involves asking tough questions like how many people can the world truly support and should anyone be allowed to live the life of even the average American if not everyone can? I encourage everyone to think as deeply whenever they feel inspired to resolve or bring awareness to an issue. By all means do so, but ask yourself, have I considered all sides of a problem or am I addressing the actual root cause of it? This is not only important because we fail to see the larger context of a problem but because there are forces in the world that would lead us into feeling good about making negligible or cosmetic changes in order to mask reality for their own benefit. I think this entry well establishes the fact that the issue of climate change needs to be looked at on a broader scale as well as on a more human and personal level. It’s sad to hear of the devastation and poverty going on in Durban, but inspiring to hear about what we as humans could do to aid and recover the situation as much as possible. We need more advocacy for climate change to be looked at as a human rights issue, and it’s people like this, students interested and motivated to make a change that can be the ones to bring a change to the way the issue of climate change is approached. I especially agree with the author about the priceless value education has rather than the more common approach of giving aid in the form of money. All humans are effected by climate change and it’s something we can really come together for to make a change, and it starts with shifting the views off of politics and onto human rights. I agree that the possibility of addressing “two huge issues at once,” in the form of climate change and human rights, is certainly plausible, if not preferable. 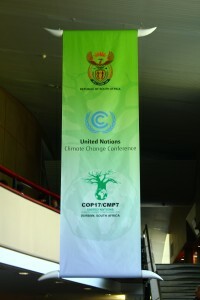 Climate change and poverty are substantial and increasingly pressing issues on the global stage. However, I feel that a prioritization of these issues’ importance may digress from the more pertinent matter of mitigating their respective growths. Climate change undoubtedly has the potential to amplify the effects and magnitude of poverty on a global scale. Collective global efforts to minimize climate change may mitigate impending poverty resulting from the displacement of large populations, refugee crises, etc. In light of such repercussions, contemporary climate change mitigation legislation is of the utmost importance. At the same time, international efforts to combat existing poverty are equally necessary in order to avoid an exacerbation of such circumstances. It seems possible that addressing each of these issues may not necessitate a weighing of significance, but perhaps an allocation of appropriate resources apt to dealing with each issue.